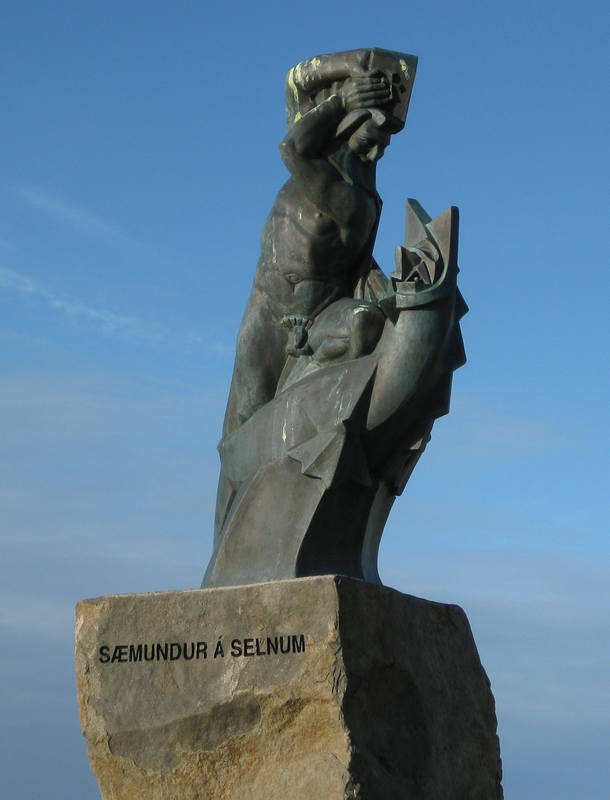 Saemundur Sigfusson (1056–1133) was an Icelandic scholar, priest, and according to legend, sorcerer, who founded an important center of learning at the southern costal town of Oddi. He was known to have studied abroad, and many said he’d been at “The Black School,” though no one quite knew where it was. People said the headmaster was the Devil. Seamunder and his fellow students received a fine education in witchcraft and sorcery, but graduation was iffy. The Devil would grab the last student out the door, and that soul was lost for eternity. Seamunder told his classmates not to worry. He told them to file out first, and then he donned a large overcoat. When the Devil reached out, he caught the coat. Seamunder slipped free and ran out the door, though as it closed, it injured his heel. The Devil had it in for Seamunder after that, always trying to trick him. Once Seamunder told the Devil he’d give him his soul in return for a voyage to Iceland in which he never got wet. The Devil took the form of a large seal and told Seamunder to climb on his back. The Devil was careful – not a drip of water touched his passenger. Seamunder spent his time on the Devil-seal reading his psalter, and as they neared the shore, he began to beat the seal with his prayer book. Startled, the seal dove under water, Seamunder got dunked, and made his way to the shore near Oddi, a free man. Legend has Seamunder playing numerous other tricks on the Devil, who is always portrayed as honest and not quite the sharpest tool in the shed. This information comes from a pamphlet designed by the Oddi Society. Founded in 1990, the Society’s goal is to make Oddi a center of learning again, this time with an emphasis on the environment as well as Icelandic heritage and culture. This entry was posted in Folklore, History, Travel and tagged folklore, history, Iceland, Legend, travel. Bookmark the permalink. There is something amusing about thumping the devil — even if it was with the Psalms and not a full Bible. What a great story! I think there would be a market for a collection of such tales. Something to ponder. Thanks. I do think along those lines from time to time. Thanks. There are more coming.